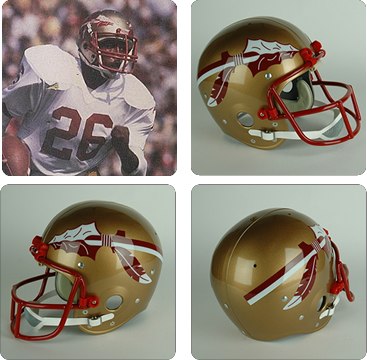 GridironMemories witin the past year created two new sites and domains to feature on one site our High Quality Collectible College Helmets, Autographed Helmets, Face masks and Accessories at GridironMemories.net. Our other venue features our unique “BYO” Build Your Own Helmets site located at GridironMemoriesBYO.com. Both site sell the products that from Historic Helmets featured by HELMET HUT. Please choose an option below to access either of our venues and thank you for shopping with GridironMemories. was created to bring to the novice and experienced helmet collectors a unique online “Build Your Own” helmet package that simplifies and exemplifies the “throwback helmet” building experience. 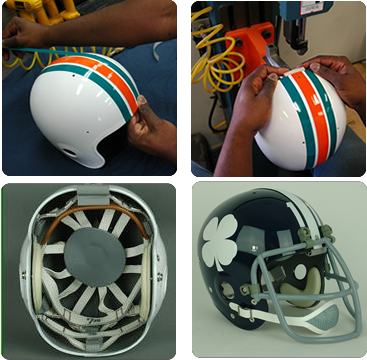 GMbyo also offers the same wide array of helmet accessories that our GridironMemories.com site does to enhance your helmet building process. Choose from any of our 7 different styles or our clear style shell to begin the process. You may choose to add a variety of enhancements such as stripes, numbers, facemasks and by all means, once you receive your custom built helmet, add your own decals such as your High School team logo. The design possibilities are endless and the end results are always “eye popping”!